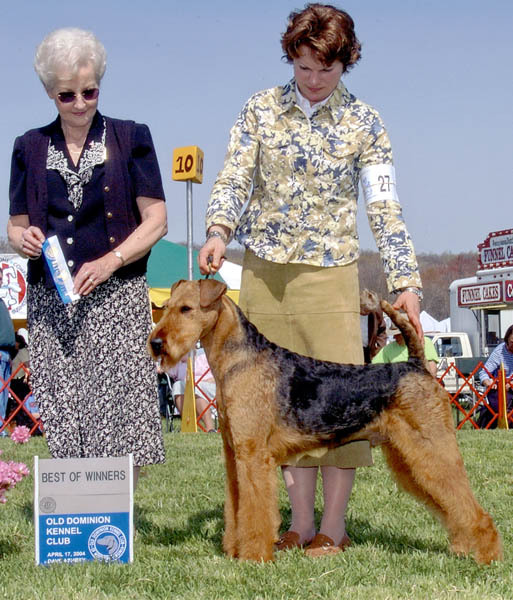 In his very first show, at the tender age of 10 Months, Joval Light My Fire (Logan) won Best of Winners at the Greater Philadelphia Airedale Specialty and Acquired his first Major. 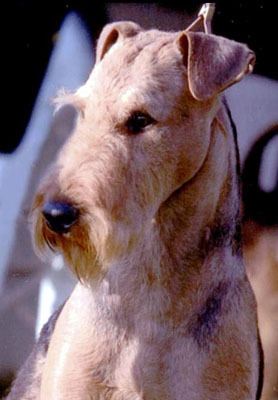 He won Best in Sweepstakes at the same specialty as well as Grayslake Airedale Specialty. Also, Best Airedale Terrier Puppy at the Richmond Terrier Specialty. Logan easily finished his championship by winning 3 majors and going BOB over the specials. He will continue to be "specialed" in 2005 and has proven to be an excellent Sire. 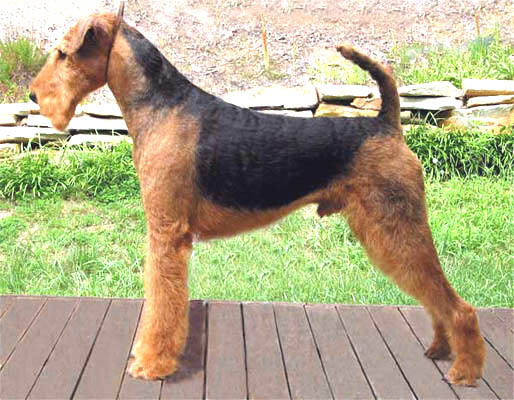 Logan passes along his wonderful temperament with his correct conformation (Long, clean & beautiful head, laid-back shoulders, dead level top line, perfect tail set & all with true Airedale movement), thus creating a highly desirable combination. Logan also possesses an impressive pedigree with an exceptionally strong mother's side. He has been used numerous times in both the US and Europe, producing many healthy puppies as well as several champions.